Been away from photography for a while but I'm feeling pretty good right now. So I've been working hard this month trying to get my photography skills back. Thought you might enjoy seeing my first photo effort. I was sitting down on a log by one of the back channels along the Stillwater River. Was looking for Muskrat Mike (the local muskrat) but he must have been away for a while. That's when I noticed a funny looking bird sitting on a tree limb. 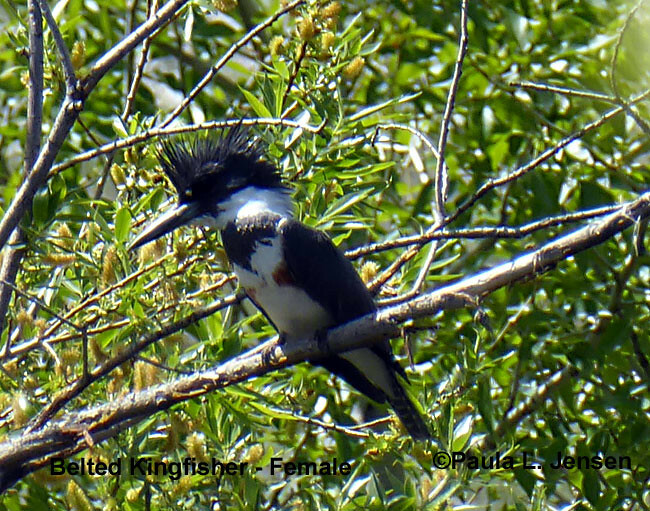 When I took a closer look, I knew that it was a kingfisher. In the past 15 years, I've only seen them a couple of times, in our area. This was a photo op that I couldn't pass up. Only got a couple of shots off but thought you might enjoy seeing my latest little pal. Nice shot and I am jealous as can be. I see Kingfishers pretty regularly in my area. Problem is they are skittish as all get out and never sit still long enough to get a shot. Well Done! Thanks for the kind words, everyone. Right now, the Stillwater River is really raging and I've seen quite a few critters heading over to our yard for safety: geese, deer, birds, wild turkeys and bunnies and even a big Painted Turtle. I'll see if I can post a few pix later today or tomorrow. I've never seen such a mass exodus of wildlife to escape the high water. I strongly suspect that the same thing may be happening in the Park with more animals near/on the roadways. So keep your eyes peeled! What a great photo! I've been looking for Kingfishers for years, and caught one diving in and out of the water near the Warm Springs in Grand Teton, but too far away and too dark to get much more than a vague shape that says is IS a Kingfisher. So I'm extra-loving this shot. Just wow! Thanks for sharing.